Total Nursing Care specializing in Home Care Patient Services and Occupational Testing, Total Nursing Care Inc. has 60 Registered Nurses, Nurse Practitioners, Registered Practical Nurses, Personal Support Workers on staff. Registered Nurse “on call” 24 hours/day, 7 days/ week. We offer a large accessible office/ clinic space setting with room to expand as needed. We provide a Modern waiting room with leather couch and plasma television with movies to entertain and occupied clients while waiting to be served. Our Testing Facility is Wheelchair accessible. We are located on a main artery in the South End of Sudbury. Professional and curious office administration. We demand strict adherence to our patient right to confidentiality. Total Nursing Care Inc. staff all signconfidentially agreements upon hiring. Why Choose Total Nursing Care Inc.
Total Nursing Care Inc. is a local owned and operated and has been providing Home Care services to Sudbury for almost 20 years. Total Nursing Care Inc. gives 100% effort and attention to detail, providing you the highest possible quality and service satisfaction. Total Nursing Care Inc. has been recognized as one of Sudbury most established and respected home care agency. Total Nursing Care Inc. staff report an overall high level of employment satisfaction. 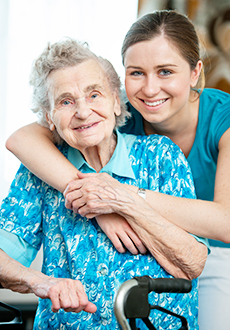 We boast a very low turn over in staff in comparison to other home care agencies. Happy Employee’s means Happy Clients and better overall level of care. Total Nursing Care Inc. client’s report an overall high level of service satisfaction with regards to our reputation to go “above and beyond” your expectations of a home care service provider. Total Nursing Care Inc. is recognized as a community leader in the field of Home Care. Total Nursing Care Inc. is locally owned and believes in giving back to our community by way of Nursing Scholarships Program, Continuing Education, and Volunteering for numerous local charities and board appointed positions and has been appointed as Chair of Sudbury’s Nursing Advisory Committee advocating and implementing positive change with regards tothe delivery of health care and home care services within our community. Total Nursing Care Inc. has been decorated with many local community and provincial awards which recognize the exceptional service you can expect from our office staff and team of community nurses and home support workers. Our philosophy of care is based on the belief that care directed to the individual contributes to the health care of the population as a whole. Our purpose is to provide affordable, reliable and competent nursing and non-nursing service. Total Nursing Care Inc. aspires to achieve excellence in all service divisions and conducts a continuing and comprehensive quality assurance practice, which exceeds ministry guidelines.